Few days before, I got a big bunch of spinach leaves from the market. Even after used it for green rice, I had leftover. I always use only fresh spinach leaves for my cooking. So, I didn't want to store the spinach leaves in the fridge and at the same time, I didn't want to throw it also. 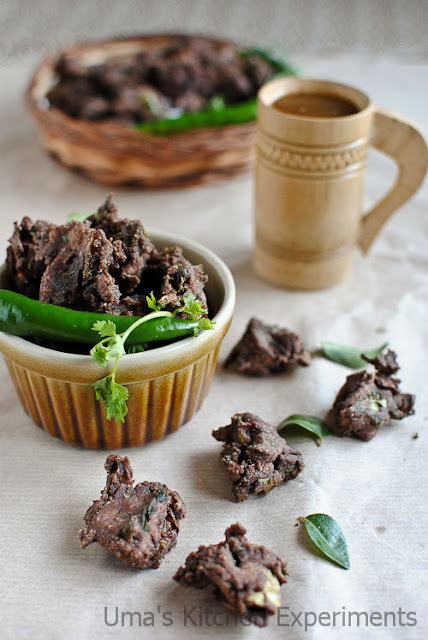 In the evening time, I planned to prepare ragi pakoda to accompany tea. I remembered about the left over spinach leaves and used them while making the dough for pakodas. As I used spinach in very less quantity, none at home were able to find out the addition of spinach. If you make it for kids, you can add more spinach leaves and make them to eat greens at least this way. 1) Mix all the ingredients except water and oil. 2) Add water slowly to the mixture and make a tight dough. Don't add too much water. Otherwise, pakodas absorbs more oil. Taste and adjust the salt. Keep aside. 3) Heat oil in deep bottom kadai / frying pan. 4) When it is hot and not smoking, drop a very small piece of dough into the oil. It should come to surface immediately. 5) Now, pinch a very small portion of dough and drop into the oil slowly. 6) Fry till the 'shh' sound goes off and pakodas turn in its colour. You can also notice the bubbles in the frying pan reduces when the pakodas get cooked. 7) Remove pakodas from the oil using a ladle and transfer to a plate covered with kitchen towel, to absorb excess oil. 8) Serve hot with tomato ketchup. It tastes good without any condiment too. 1) Add more spinach leaves if you prefer. 2) Always make tight dough for making pakodas. I measured oil before and after frying and there were only 1 and 1/2 tablespoons difference for both. So, consistency of dough is very important. 3) Best to have it immediately after frying the pakodas. Otherwise, few pakodas become hard to bite if you store it in a container or kept as such. 4) If you don't have spinach, add more onion. More the onion, more the taste. 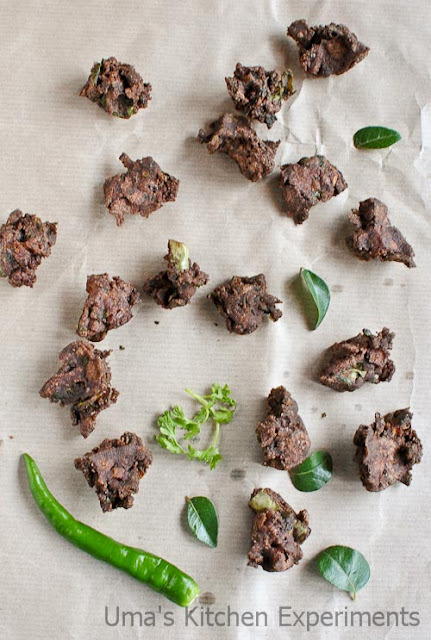 Ragi vaarama Uma ore ragi recipe ya pottu kalakurenga...Pakoda looks so tempting and loved the addition of spinach to it..
nice clicks.. i too have that wooden glass :) yummy pakoda.. 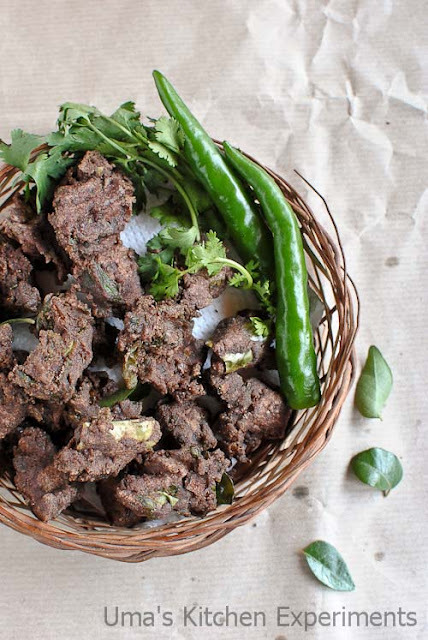 Delicious and healthy pakoras. Thanks for posting this lovely recipe. 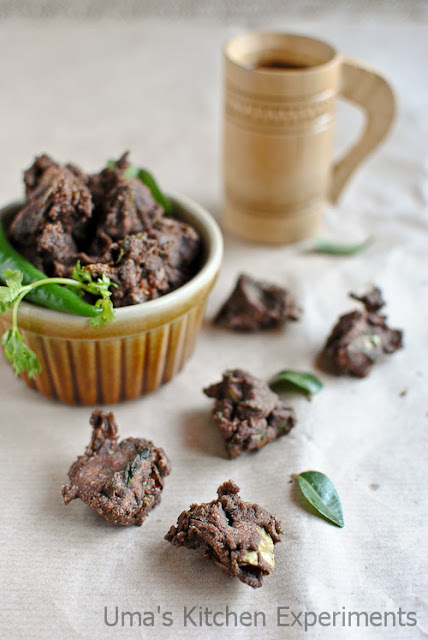 i too make this ragi pakora sometime, i used to add little wheat flour n rice flour too..pakora looks yummy! "இந்த வாரம்...ராகி வாரம்"..அப்படியா உமா?! :) ஸ்பினாச் சேர்த்து ராகிபகோடா செய்ததில்ல, நல்லா இருக்கு! Crispy and delicious looking pakodas...Gal I loved that wooden cup...very cute.. This is a fantastic combination..they look so crunchy! What if I mix some besan in it - will it make tastier? @ Shyam Chhabria, I have added rice flour to it. but never added besan. If you want to try, add it and please let me know how it tasted. Very interesting. 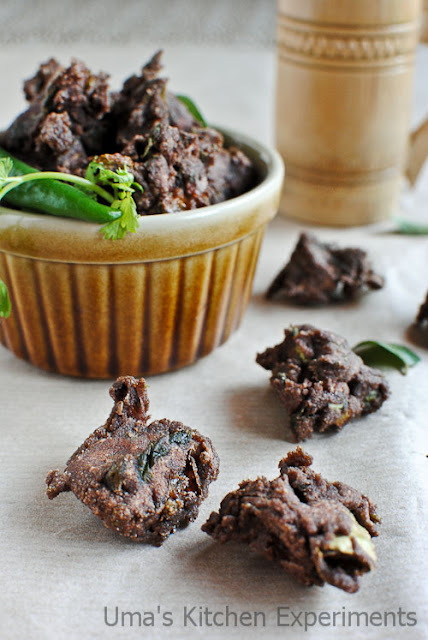 I never knew that pakodas can be made from ragi :). Will definitely try this.